Acer brought a serious suite of new tools for &apos;prosumers&apos;, with laptops, desktops and monitors geared for professional use, to its annual [email protected] event in New York City. 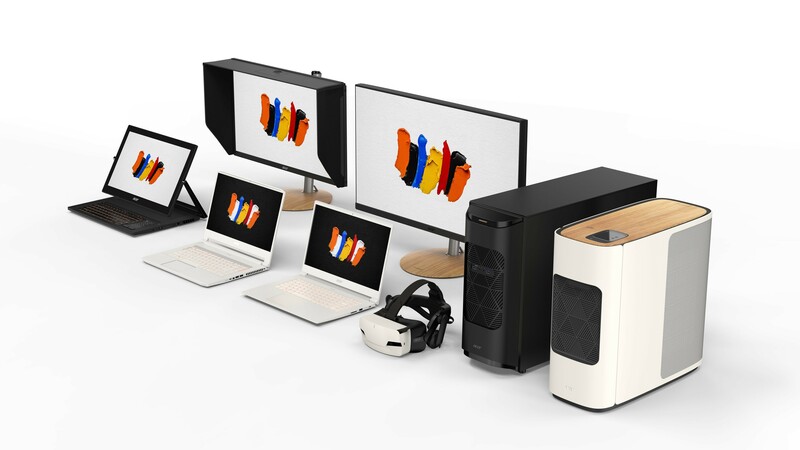 The new line is called ConceptD and includes even a VR headset designed for digital engineers. The new family of ConceptD machines are designed with a simple aesthetic to be timeless, and the series of laptops could be a boon for on-the-go creatives. The mobile lineup includes three laptops. The ConceptD 9 is the series&apos;s premier mobile workstation. The laptop has a 17.3-inch, 4K UHD display built on a hinge that allows it to flip, rotate and extend in a way similar to the Microsoft Surface Studio. That sharp display also sports Pantone validation for color, with 100% coverage of the Adobe RGB colorspace and a Delta E (a professional method of calculating color accuracy) of less than one. The screen, paired with a magnetically-attached Wacom EMR stylus, allows for 4,096 levels of pressure sensitivity as well. Powering the whole experience is up to a 9th-gen Intel Core i9 processor and Nvidia GeForce RTX 2080 graphics, all cooled by Acer&apos;s 4th-Gen Aeroblade 3D fans to keep the system cool and noise below 40dB. The ConceptD 7 and ConceptD 5 lack the unique hinge design, opting for a traditional laptop style, but still offer creativity-focused specs. Each has a 15.6-inch 4K UHD display with 100% coverage of the Adobe RGB color space, and a color accuracy of Delta E less than two. The ConceptD 7 offers higher performance on up to a 9th-gen Intel Core i7 CPU and Nvidia GeForce RTX 2080 Max-Q GPU. The ConceptD 5 steps it down just a little with an 8th-gen Intel Core i7 and AMD Radeon RX Vega M GL graphics. But, this is also the thinnest and lightest of the bunch at 3.3 pounds (1.5kg) and just 16.9mm thick. The ConceptD 9 will be available in North America in June starting at $4,999 (about £3,830, AU$7,045). Meanwhile, the ConceptD 7 and ConceptD 5 will both launch in April in the US, starting a t $2,299 (about £1,760, AU$3,240) and $1,699 (about £1,300, AU$2,390) respectively. More regional availability will follow at a later time. 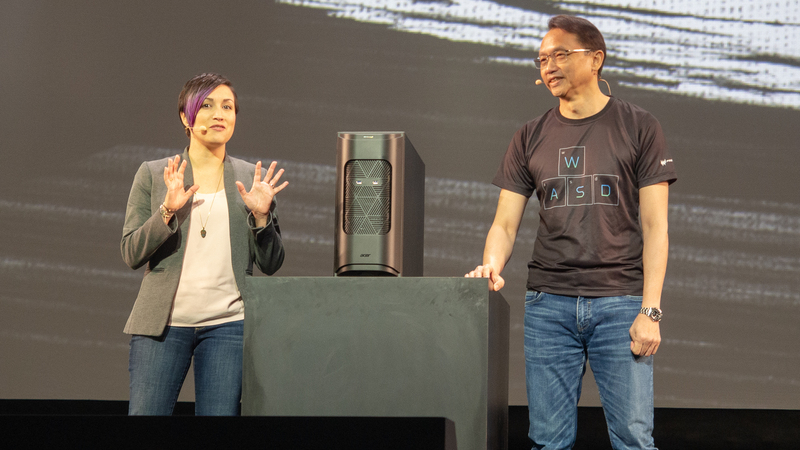 Aside from the mobile products, Acer also announced two professional desktops, the ConceptD 500 and ConceptD 900, with the latter powered by dual Intel Xeon Gold processors, up to 192GB of RAM and an Nvidia Quadro RTX 6000 GPU. A new engineering-focused Windows Mixed Reality headset called the ConceptD Ojo is coming as well. And, rounding out the ConceptD lineup, Acer also launched a pair of VESA DisplayHDR 1000-certified monitors with 99% coverage of the Adobe RGB colorspace and color accuracy of Delta E less than one. Pricing and availability details are vague and scarce, but we know that the ConceptD 900 will be available in the US starting this May and in Europe in June for a whopping $19,999 (about £15,340, AU$28,180). The ConceptD 500 will be much more affordable, starting at $1,699 (about £1,300, AU$2,390) when it launches in June in the US, and Europe in July.